An international team of researchers led by scientists at the Australian National University (ANU), have had the honor to exhibit for the first time the “ultra-fast transmission of information” via nano-antenna that had been integrated on to an optical waveguide. Suffice it to say, the technology, currently in its nascent stage, does have the potential to ramp up telecommunication applications, when it comes to high-speed data transferring between (selective) devices. What we showed is that such an antenna of sub-micron size can sort and route different streams of information (encoded into the different polarizations of light) into different directions of the waveguide. This is a very important operation used in coherent receivers for any communication link. Moreover, the researchers were also successful in significantly reducing the size of the optical component. This component is needed for the crucial polarization sorting to a tiny (sub-micrometer) antenna. Simply put, the shrinking method can potentially result in even more integration (i.e., high-density) of photonics components in conventional silicon chips. The optical nanoantenna operates through plasmonics. In plasmonics, incoming light excites electrons on the surface of a metal so that they begin to move across the metal’s surface in plasmon waves. These plasmon waves have a much smaller length than even the smallest wavelength of light. As a result, it is possible to make devices on a much smaller scale than those that would depend on light by itself. 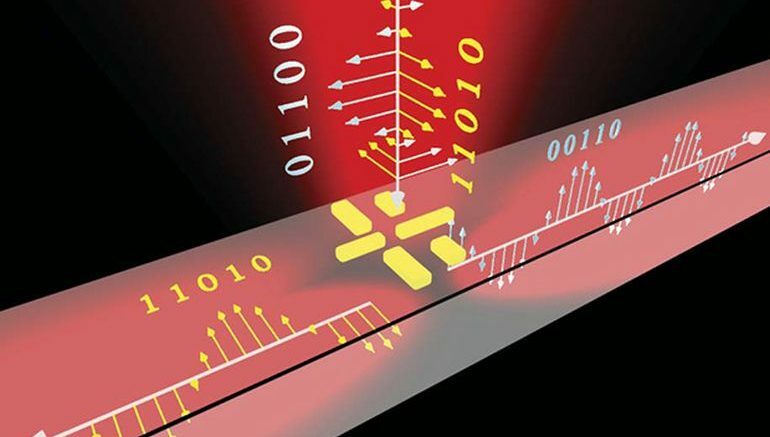 Plasmonics has led to the very real possibility of creating so-called photonic integrated circuits (ICs) in which photons could replace electrons. The entire structure needs to be made CMOS compatible. The currently used gold bars will have to be replaced with another metal, possibly aluminum, to be compatible with the standard CMOS fabrication. 1 Comment on "Scientists demonstrate high-speed data transfer via on-chip nano-antenna for the first time"